Ahead of tonight’s friendly between Russia and Ivory Coast, we’ve teamed up with established website Russian Football News in putting together a joint match preview that marks the start of Marc Wilmots’ reign (albeit he won’t be in the dugout) as coach of Les Elephants. Russia are deep into their preparations ahead of a home Confederations Cup this summer, while Ivory Coast are aiming to bounce back in a positive fashion after last month’s disastrous AFCON group stage collapse. On the back of a humbling away defeat to Qatar and a mediocre, dare I say lucky victory over Romania back in November, Russia embark on March’s brace of internationals against Ivory Coast and Belgium in a slight malaise. Aside from testing themselves against a range in the type of opponents they could possibly face over the summer, the most important thing over the coming week is to establish form and a way forward in what has to date been a stuttering preparation period. We’re three matches away from the Confederations Cup, and while it has been interesting in some regards to see a raft of systems and players being deployed over the last 9 months, Russia plainly need to start setting down a blueprint. Injuries to key assets (Artem Dzyuba), retirements (Vasili Berezutski) and ill discipline (Aleksandr Kokorin) have forced another batch of alterations to the Sbornaya squad, which would’ve left Stanislav Cherchesov tearing his hair out, if he had any of course. Cherchesov has persisted to ingrain a three at the back with wing back system for the national team of late, but so far to little success. Over the last international break, Russia couldn’t get into the Qatar encounter until late on, while at home to Romania, they needed to switch the formation back to a more typical 4231 for the second half to force a result, that being said it wasn’t much better. The question remains what approach Russia will deploy in these upcoming encounters? Starting from the front, the withdrawal of Artem Dzyuba through injury negates any potential of the Zenti captain lining up alongside Krasnodar’s Fedor Smolov, who himself is still recovering from an injury that’s kept him out since early March. The lack of forward options may tempt Cherchesov back into deploying three at the back, with Viktor Vasin, now back at CSKA suggesting in recent weeks that he deserves another chance for Sbornaya. Elsewhere, the return of Alan Dzagoev is a massive one, given Russia have struggled to keep hold of the ball in their last two matches. If Russia are to star at the Confederations Cup, their key men need to be fit and firing in a setup they’re familiar with. While consistency in attack is at a premium due to numerous setbacks, the core of the side; at centre back and in centre midfield needs to be solidified this window. At present we may go into the summer, with players picking themselves on reputation alone, as few of the new players have made telling impacts in the last few call ups. One exception to the rule has been Alexander Miranchuk, who briefly showed his brilliance and potential to turn a game against Romania. Coming off the back of some solid domestic form in the RFPL, he should be tested in the starting lineup again. Viktor Vasin – With Vasli Berezutski announcing his international retirement earlier this month to join CSKA teammate Sergei Ignaeshevich in the stands, Russia now know they will go into a home Confederations Cup with a brand new centre back partnership/trio. Spartak’s Ilya Kutepov has been solid, if not spectacular when called upon, but the reemergence of Vasin at CSKA after being recalled from his loan at Ufa offers up Cherchesov a quick fix to the Berezutski news. Collecting three clean sheets in as many matches since the resumption of the RFPL, Vasin also now has experience of playing in a back three at a leading club, something Cherchesov will no doubt relish in slotting the defender straight back into his starting thoughts. Mario Fernandes – CSKA Moscow’s Brazilian born right back has received late clearance from Ivory Coast to start for Russia tonight, somewhat ahead of schedule after previously being expected to only become eligible from May. The defender’s impact is likely to be on a whole different level compared to those of the past (Neustadter and Guilherme), destined to become a fixture in the Sbornaya starting XI from the word go. Fernandes has experience of playing in a back four and as a wing back over the last 12 months with his club side, crucial expertise that will prove invaluable going forward, possibly freeing up Aleksandr Samedov to move into a more central attacking role. Assumingly fighting a losing battle for the NT striker position against Dzyuba and Smolov, the fact both could be out injured for at least the Ivory Coast encounter, could see the 32 year old, gain a national start for the first time in 6 years. It seems like an eternity has elapsed since Ivory Coast were being tipped to retain their AFCON title back in January. Sure, they had stuttered rather than sparkled since their continental triumph in 2015, but they had gone unbeaten since then, despite the retirements of Yaya Toure, Kolo Toure and Boubacar Barry. The defence of the title they won in 2015 turned out to be a disaster. The players part of the crowning in 2015 severely under-performed, while the talented players at their disposal all made those who billed them to have good tournaments look like fools. Most worrying of all, they tumbled out of the tournament without a whimper, exiting with 2 draws and a loss, never playing with the gusto to win any of those. A group stage exit made positives hard to find even for the most fervent fan. With his position untenable, French coach Michel Dussuyer duly departed after the tournament and was on Tuesday replaced by Belgian Marc Wilmots. For this international break it is interim coach Ibrahim Kamara who will take charge, with Wilmots set to take the keys thereafter. The absences of Serge Aurier, to injury, and Jean Seri, because he’s due to get married (an injury in its own right!?) in a few days, means Ivory Coast won’t be at full strength for this match. Aurier in particular has been one of Ivory Coast’s most important players since he emerged in the orange colours in the summer of 2013. Though a right back, the attacking intent and great delivery he has provided down the flank over the years has often been fruitful for his nation. Seri, who has been one of the most creative midfielders in Europe this season, will also be a big miss for a side that has struggled for central creativity lately. 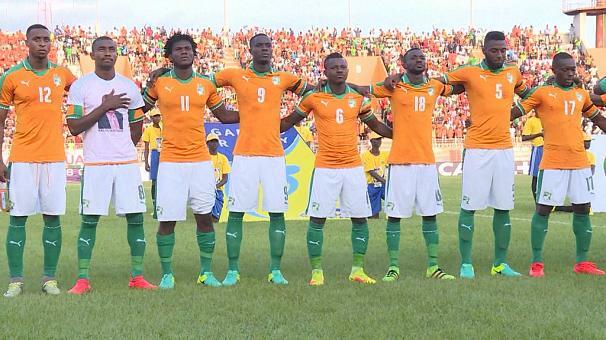 Ivory Coast have typically played in a 4-3-3 formation in the last decade, and that is unlikely to change on this occasion, where Kamara will look to steady the ship rather than let it sink after the torrid tournament in January. The Ivory Coast defence usually names itself, and with the likes of Eric Bailly and Sylvain Gbohouo, arguably the best goalkeeper in Africa, to count on, is usually the strongest part of the team. Some new faces in it may mean it’s not as sturdy as usual, but it gives game time to Simon Deli, Abdoulaye Bamba and Mamadou Bagayoko in a defence that rarely changes. Captain Serey Die should start in midfield, though his accomplices could be any two of Franck Kessie, Cheick Doukoure, Moussa Kone, or Jules Crist Eboue, who should be familiar to followers of Russian football. There’s much debate about the composition of the midfield, though it’s largely agreed Kessie should keep his place despite a series of clumsy performances in January. Energetic, mobile and able to contribute goals from midfield, the Atalanta midfielder is seen as the heir to Yaya Toure and has had a stellar full debut season in Serie A. In the attack we should see the English-based duo of Jonathan Kodjia and Wilfried Zaha. The latter, who was expected to fill in the big shoes left by the injured Gervinho, has been underwhelming so far in the Ivory Coast jersey. Roger Assale, who made the move from TP Mazembe to Young Boys in Switzerland, should be an interesting option. The winger has made a bright start since crossing into Europe in January. For years he has been one of Africa’s most electrifying talents but deemed too raw to be a regular starter in an Ivorian attack full of largely chiselled, European-honed attackers. Eric Bailly – Now the pillar of the defence after the retirement of Kolo Toure. The centre-back had just made his top-flight debut with Espanyol when he was summoned to the 2015 Cup of Nations, ending up playing every single game as ivory Coast emerged victorious. His rise has rapidly continued since then and he now finds himself at Manchester United. Still just 22, his talent is undeniable. The only question mark for club and country is consistency, particularly in phasing out rash moments. Serey Die – More known for his tears to the world, better known for his tenacity to followers of African football. The captain plays every game like it his last, not only in his intensity but also his tendency to collect yellow and red cards. The tunnel-vision of tournament football saw the Ivory Coast midfield chopped and changed in AFCON 2015 but the selection of Die was unquestionable. Jonathan Kodjia – The Aston Villa striker had a disappointing AFCON, with the delivery not there to let him flourish, not to mention the selection of Salomon Kalou proving obstructive rather than conductive in his search for goals. However, if you ignore that 3-game spell, he has been one of Ivory Coast’s shining lights in the last 12 months, scoring some sensational strikes which have quickly endeared him to fans.